Love in the moonlight surely give us happy and sweet memories. Many sides of love and being loved care and being cared and so many other things. It was a beautiful scene from the last episode we really enjoyed. After getting off the charges being the daughter of rebel Ra On was set free to live her life. She opened a book store. As she love to write love letters for the people and also told them beautiful stories. Finally she got her passion into a profession and started writing novels. She completed 10 novels and put them in the front row with the title top ten most popular Novels. 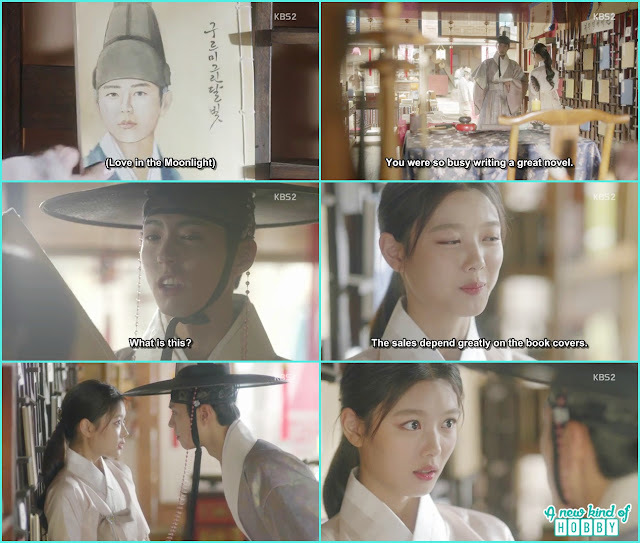 The last one attract our attention it was with the title "Love in the moonlight" with Crown Prince sketch on it. Crown Prince happen to stop by and seeing his sketch on the novel he was surprised and ask Ra On without his consent how can she use his picture and write a novel on his private life. Then he ask Ra On to pay for what she did and she was surprised saying "In here". Then suddenly thinking on something weird put her hand on her lips. We smiled so was Crown Prince man what was she thinking, the Crown Prince just ask to pay him with a bun from every novel earning. Darn to her thinking she sure is Ra On after all. The Crown Prince along with Ra On take a walk. It was a beautiful scene they both were in the flower fields which make the atmosphere more dreamy. Crown Prince ask Ra On what made her write a novel and tell people about his private love life. But Ra On wrote this novel as she wanted to tell the people how an arrogant Prince change into a mature great King for the nation. It wasn't the end of Question he then proceed to the next question and ask "Who are you " listening to Ra On answer he didn't satisfy as it wasn't according to his perspectives. Then he told "she is the one who filled his world". How brief and beautiful answer Crown Prince said as how much he love and care for Ra On . After that he didn't just use beautiful words to express his love and feelings but he kissed her and it was another beautiful kiss with full of emotions. We will for sure remember both their love.